Automated analysis of facial expressions on a set of famous portraits. Click for more portraits. Is a company’s understanding of “quality” the same as its customer’s? This semantic map shows what quality may mean to different guests of a restaurant. A project that mapped the fragmented availability of different types of TV content on streaming services and devices for three use cases: a full-season binge, mid-season tune-in, and last-episode catch-up. I used my Core Metaphor Elicitation Technique (COMET) to compare implicit and explicit motives between younger and older cohorts. When I worked on Supercuts, I conducted an experiment that showed that others’ perceptions of one’s income, age, and other traits can be influenced by one’s hair style. 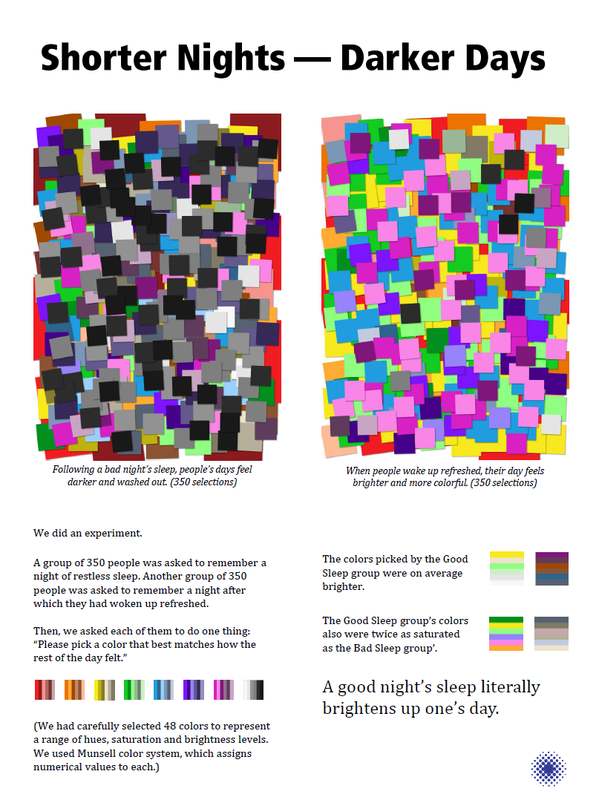 An experiment I conducted while working on a mattress brand showed that people see the world in darker and less saturated colors after a bad night’s sleep. Details. The Ford vs Chevy fan rivalry is real. Team Chevy shows intense positive emotional response to their brand, and is cool towards Ford, and vice versa. From a fandom research project for an auto brand. Surprising exactly no one, Hooters elicits the strongest positive emotional response among men, and the strongest negative response among women of the five chain restaurant brands tested. An experiment showed that people are willing to pay more for products when they are accompanied by a story. Read about the findings. I replicated Vicary's classic experiment to see whether subliminal advertising works. Read all about it. I designed a data collaboration space. See how it turned out. Life journeys of two adult PhD students assembled from their social footprints to inform strategy for a higher ed brand. We Jerzified ourselves to understand how memes spread online. Read our report. Designed a business dashboard for a hospitality brand that shows the number of bookings on a specific day and for a specific day relative to a benchmark.